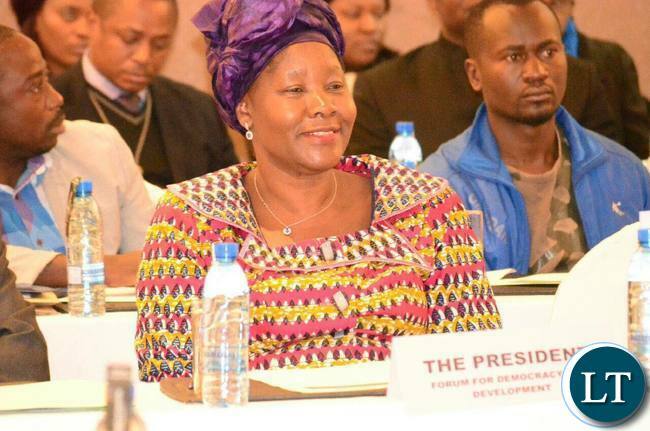 Forum for Democracy and Development -FDD – President Edith Nawakwi has proposed a ten-year ban on political parties that will be found guilty of fanning electoral violence. And Ms. Nawakwi says the proposed amendments to the Public Order Act, Electoral Act and Constitution can help deter violence in elections. She says it is unacceptable that people must be found with offensive weapons or even spill blood over their determination to amass power. The Opposition Leader says Zambia is too beautiful to be destroyed and that all Political parties must not use violence to fight for power. Meanwhile, Ms. Nawakwi told ZNBC News in a telephone interview that FDD is going to support the proposed amendments to the constitution because they are progressive in helping to deal with violence and other electoral challenges, which will in turn help promote Peace. And New Revolution Party President Cosmo Mumba said there is need to restrict the sale of offensive weapons such as pangas. Dr. Mumba said the Ministry of Home Affairs must also ensure road blocks are set up in places where there are by elections to ensure NO transportation of offensive weapons. Meanwhile, members of the clergy have applauded President Lungu for championing peace and showing political will to end violence during and after elections. Independent Churches of Zambia board chairperson David Masupa says the Head of State has shown leadership by preaching peace and urging PF members to observe the electoral code of conduct and denounce violence. And Bishops Council of Zambia General Secretary Abel Kaela said there is need for the church to condemn all forms of violence regardless of the perpetrators. Meanwhile, Vision Ambassadors national coordinator MISHECK KOMBE says PF’s victory in the Kafue town council by-election has shown that democracy is growing in the country and that voters are heeding the Head of State’s repeated call for non-violent elections. Next articleInflation rate for March 2019 has reduces to 7.5 percent. Violence is as a result of people doing nothing, you are not a big player and nothing to lose, to you its ok with that, the solution to this violence is for government to empower people, let people be busy with work, business etc, and this will end. Nawawkwi has become irrelevant. Being quoted together with New Revolution Party. What a shame. What if any other party is banned apart from the UPND? What if any other party is banned apart from the UPND? You mean there will not be any cry from anywhere? This another political platitude issued by a useless political leader gone to bed with PF the most violent party in Zambia. There is no need for such because Lungu does not respect the rule of law. He is in the fore front in breaching the constitution. So how can he adhere to that proposal if PF is found wanting. All these changes flying about are there to show ICC that PF is ready to change. No need to ban the entire party … just get the culprits into prison walls and throw away the keys. The situation will self-correct itself. Edith, we don’t need any over-engineering here … just keep it simple. The best things in life are just that. Banning UPND will make Nawakwi look worse than the violent PF. So Ba Nawakwi enjoy your looks, don’t your mind make you look ugly. She is the best example of someone who is sexually starved. At one point I thought that Nawakwi was normal, but now I think she also needs an extensive mental examination, following the queue, she will be number two and both will be examined at my cost. Does this woman live in Zambia or on planet mars? All I can detect is idiocy in her. In fact she may have been out ran by Antonio, she probably was looking for a job that Mwanza has taken. Sorry mayo you are late. Ubupumbu bwena emo bwaba muli imwe bamayo. Edith you Fididi is defunct, just leave the political space, you know very well that the violent party is PF, do you think they can ban themselves, try to make political sense if you are to remain relevant in politics. SO CALLED INTELLIGENT PEOPLE ARE PROVING TO THE WORST BOOTLIKERS. THEY THINK ZAMBIANS ARE *****S.
Nawakwi this cannot work and you know it. Whichever way you look at it.Police are just doing their job by dealing with violent cadres but before they know it they are retired in national interest. How can a country effectively fight violence like that? I am non partisan but I agree with the question that somebody posed to say is it okay to say there will be chaos in the country in 2021 if I am not allowed to stand by the courts but in the same vein condemn and call archbishop Mpundu stupid for issuing a precaution to say if we don’t dialogue there is potential for violence. Edith, sometimes you are very disappointing with the things you say sometimes. You are no longer as vibrant as you used to be. You have just reduced FDD to a cash cow, to cash in on donor money for female candidates. Why should you main qualification be your gender? You are just a spoiler and a puppet for the Architects of violence – PF and everyone knows which one is the Panga family! How can PF ban itself? The question is ‘who will ban who?’. Laughable. PF cadres were beaten for violence in Shesheke. Will the government ban it’s own party? Use your tiny brains Natalie. Violence is evident on many video clips everywhere. P.F leads the way!! Cage Mwaliteta for 10 years and it will send a good signal to law breakers. The proposal is very welcome and this is what we expect our honorable MPs to be proposing when in Parliament. Violence is a foreign phenomena in our country and anyone regardless of his or her standing found instigating this ugly thing will have to face the wrath of the people through the law. The proposal is very welcome and this is what we expect our honorable MPs to be proposing, debating and discussing when in Parliament. Further, the identified culprits, leaders and sponsors of that party shall NOT be allowed to actively engage and participate in any other party directly or indirectly. THIS LAW SHALL BE applicable to ALL and hence its non-discriminatory. Who is Nawakwi and FDD? These are just one member parties. In Zambia, even tutemba parties have a say. Notice that all those who lost to HH in 2006 ( Saki and Nawakwi) went ahead to form tutemba parties and have been barking at UPND toothlessly. We know why they bark at HH when there is nothing to bark at – because they are bitter they lost to him in 2006. Simple and Period. A much better ban would be in a constituency a party perpetrates violence, this way that party would know they will be underrepresented at parliamentary and ward level, also the presidential candidate should be added to the ballot papers for that constituency. Every party would think about the repercussions then, especially in if it was in their back yard. Since there is no law that says cadres should defend themselves against other cadres with violence even the party attacked be banned. Like Kafue where Mwaliteta was caught red handed with offensive weapons? Actually I am surprised not a single supporter of Upnd has made reference to this incident. day by day she makes herself irrelevant . what she speaks even a grade seven drop out cannot say it. no wonder your party has failed even when your fellow women of zambia wanted to support you, but such foolish talks its impossible. and you will never ever be a president of this country forget.